Don’t we love the fact that there are so many independent designers launching their fabulous wares every other day in our fair city. Whether it is edgy, modern jewellery and apparel that draws inspiration from tribal arts and crafts; or stoles that are actually works of art, and furniture with a bit of vintage whimsy, Bangalore designers are working very hard to come up with original and contemporary products. Here are five design labels that have caught our eye and you need to know about them too. They have a very unique range of jewellery with each piece being one of a kind. They are beautifully designed and definitely stand out in a crowd. 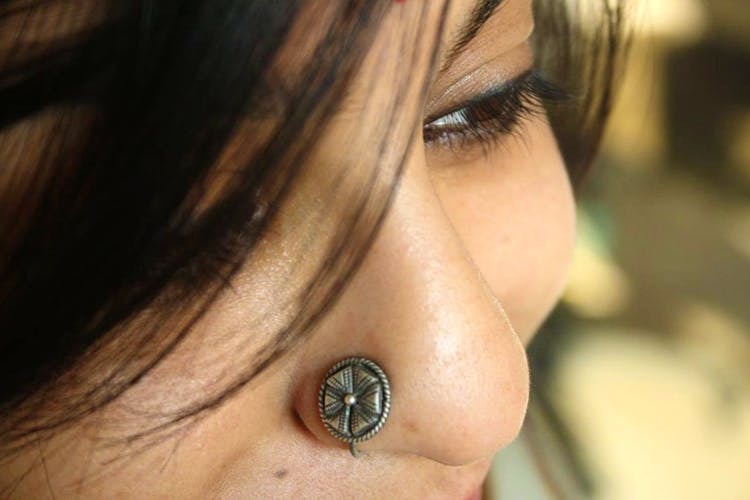 The jewellery is all designed in -house, working with silversmiths in rural parts of Gujarat and Rajasthan. We love them because they aren’t just sourced products, which you can buy at any other silver shop. Quitksmith is a Kitsch Mandi crowd favourite for this reason. Our pick: Extra large nose pins, which you can’t find anywhere else. Find them on Facebook here to order. The products designed by designer Ron Dutta for his label Fatherland are made by traditional weavers from interior tribal areas in the country. The simplicity of the designs make you want to own at least one piece. Ron has a story behind each sari, each weave, and every piece of jewellery. What’s interesting about Fatherland is that Ron creates collections, Each collection is inspired by tribal history, like his collection on silver combs that he turned into neck and hair pieces. Read more about Fatherland here. Our pick: Comb neck piece, it’s so unique and funky. Shop the collections online here. Follow Fatherland on Facebook here. We love these guys because they take the effort to create unique retro vintage furniture, mirrors, and more. Each piece is different from the other, and their inspiration comes from old school styles. They made some tables for our office and we absolutely love the stains, and faded feel that they brought to the furniture. Their finishing is great, and they are always exploring new designs. Our pick: Their new collection of white vintage stools, they look like they could be part of a dreamland ice cream parlour. With her deep-seated passion for fashion that drove her into the textile industry, Johanna started creating prints and merging the art, fashion and luxury into one product. Each collection of scarves are developed from a set of paintings that are all made in premium quality pure silk. Our pick: We like the lovely black and white printed silk scarves that are individually hand crafted to finish. Follow them on Facebook here to shop online. Lovely ladies of the Kitsch Mandi/Junta family, Nandita Dhindsa and Prajna Rajanna have collaborated their individual artistic skills and knowledge to create the perfect traveller’s bag. It is raw, rugged, local yet has a very simple design. The use of the clever buckles are an added feature to this one-of-a-kind durable canvas bag. Our pick: The vegan Traveler Bag in army green would be our favourite. Can’t wait to see more of their products using block prints and organic dyes.